The book of Acts provides an invaluable transition in the Bible from the life of Christ to the formation and expansion of the New Testament Church and the inspired apostolic letters of that era. The birth and spread of the Church, early struggles in the Body of Christ, and the conversion and later missionary journeys of Paul make for enlightening and nurturing reading for all followers of the Lord Jesus Christ. 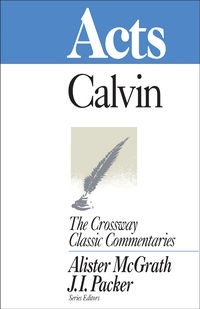 John Calvin’s insightful examination of this action-packed, fast-paced section of Scripture will give serious Bible students a solid grip on the key passages and themes of Acts. And that in turn will give believers renewed enthusiasm and boldness in taking the good news of Christ to their own time and setting.